Class for two: designed for those who want to discover this great hobby together. Spouses or friends, parents and kids, even grandparents and children have enjoyed this great bonsai experience together. Each person learns the basics by creating a beautiful tropical bonsai individually, then, each pair collaborates to create one large tree together. 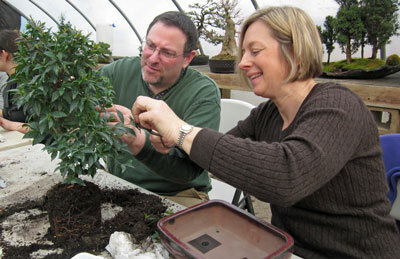 Make a gift to each other by joining forces and making bonsai! One registration is for two people.